Kathryn Shultz has written a fascinating and thought provoking piece in the New York Magazine about the self-help industry, challenging the unspoken philosophical flaw at the root of much of it. The full article is worth a read, but the main point she makes is where is this bit of the thing called the self which stays intact, immune to the addictions, fears and anxieties experienced by the rest of self and able to change that bit. Are there two selves in the self? The one with the problems and the one with both the solutions and the wherewithal to sort out the other one? Not only has nobody ever found these two selves, nobody has even found THE Self! The journalist Josh Rothman once wrote a lovely description of what a cloud really is: not an entity, as we perceive it, but just a region of space that’s cooler than the regions around it, so that water vapor entering it condenses from the cold, then evaporates again as it drifts back out. A cloud is no more a thing, Rothman concluded, than “the pool of light a flashlight makes as you shine it around a dark room.” And the self, the Buddhists would say, is no more a thing than a region of air with thoughts passing through. We know ourselves and others through the stories we tell. We create meaning and gain an understanding of the events and experiences of our lives by creating a narrative. And isn’t that quote so true? Doesn’t it sometimes seem as if the only constant in our life story is that we show up in each of the scenes. All of life, the world we live in and experience, is woven into these stories, which always, in some way, contain ourselves. But what about this idea of a plot? Because doesn’t it happen to all of us that from time to time we lost the plot? In fact, don’t many people never seem to have a grasp of the plot? Well, an interesting factor in the creation of the plot comes from thinking about Fate. Of course, we have the hand we are dealt too, as part of Fate. Sir Harry Burns, the Chief Medical Officer of Scotland, in discussing the problems of ill health in Scotland points the discovery that a grandfather’s experience can alter his genes and so pass on influences that way through his children and even their children too. We can’t understand a person, or their plot, without seeing who they are within more than their own personal lifetime. We have to consider their genetic, familial, cultural and societal contexts and influences, most of which may shape the unconscious more than they shape the conscious. Living a zombie life, on automatic pilot, will be experienced as a life dominated by Fate, but waking up, becoming conscious, examining our own lives, gives us the chance to become the heroes of our own personal stories. Plot is partly unearthed, and partly created. I love how we are able to see patterns everywhere, and how everywhere you look there are echoes and reflections. 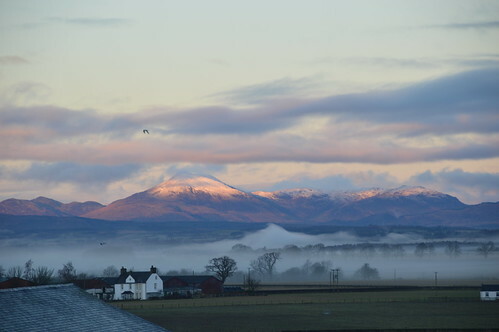 Just look how this mist rising up from the carse, builds itself to look like Ben Ledi. As Howard Bloom points out in The Global Brain, there are a couple of opposite but essential drivers at the heart of complex systems – conformity enforcers and diversity generators. We need both. But we need both to work together in an integrated way. If there’s too much of either growth, development and evolution is impeded. Diversity generators don’t just tolerate difference but give highest value to uniqueness. Conformity enforcers, on the other hand, operate by eliminating difference, setting standards and rules and making sure the whole system is compliant. In health care, it seems to me, we have an excess of conformity enforcement. The “evidence based” enforcers seek to “eliminate variation” by developing flow chart style protocols where every single patient is entered into the same pathway and is treated according to the same, limited range of interventions. There is a belief that the raw material of patients can be entered into the same machine and will come out the other end with the same product or “outcome”. But life isn’t like that. Every single human being is unique. There isn’t a single health care intervention in the world which produces the same outcome for every patient who receives it. There’s something essentially dehumanising about the enforcement of conformity on the rich diversity of individuals. I’m a champion for diversity and tolerance. I think it’s richer than uniformity and conformity. I don’t deny that we need some level of conformity (without it we’d have disintegration and chaos), but I think we’ve gone too far. Not just in health care but in many, many areas of modern society – education, politics, economics……. Where do you put your energies? Are you throwing your weight behind diversity generation or conformity enforcement? I saw this cartoon the other day and there was immediately something about it that bothered me…. 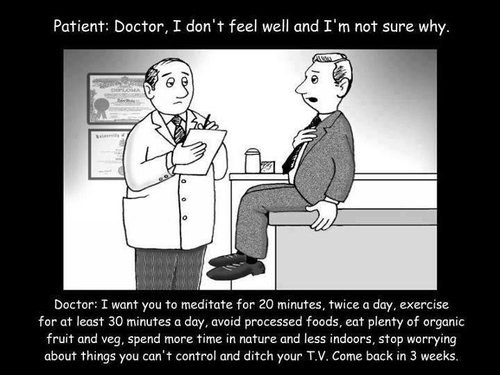 The advice from the doctor….well, I say all of those things. Not exactly as said here, but pretty close. I suspect any doctor giving advice about health probably covers a selection of these points nowadays. Maybe some would talk about “5 a day” instead of “plenty of organic fruit and veg”, and some would mention stopping smoking and drinking in moderation, but it really covers the common advice. Well, the problem is you can imagine from this cartoon that this advice has become like a standard prescription. A modern panacea. Doesn’t matter who the person is, or what they are complaining about, here’s the same advice. The person – because we aren’t hearing the story. The people who come to see us bring us their stories. They hope they tell them well enough so that we understand the truth of their lives. They hope we know how to interpret their stories correctly. We have to remember that what we hear is their story. Robert Coles in “The Call of Stories”. Stories have always fascinated me. I love them. Every day when I sit in my consulting room patients tell me the most amazing, fascinating and unique stories. As a medical student I was taught how to “take a history” – I hate that phrase actually – who’s doing the “taking” and what exactly are they “taking” and from whom? Doesn’t seem right to me at all. Instead I prefer teaching medical students how to listen to patients’ stories. However, the point is that this is the beginning of all diagnosis. To a certain extent listening to the patient’s story is a diminished art. There’s an over-reliance on technology and a lot of doctors just don’t seem to be able to make a diagnosis without a test these days. Diagnosis is a form of understanding. It’s a process of trying to make sense of somebody’s experience. If stories are so important in clinical practice, then how can I learn to handle them better I wondered? There is a developing area of medicine known as “narrative-based practice”, with associated “narrative-based research” methodologies, but materially-orientated, reductionist scientists look down on narrative. They prefer data. So, when I started to study narrative (which, technically is the story AND the way that story is told), I couldn’t find much work from a scientific perspective. I had to turn to the humanities. One of the books which I really love in this area of study is “On Stories” by Richard Kearney (ISBN 9-780415-247986). Not only is it a fabulous exploration of the place of story in human life, but it’s written completely beautifully. Richard Kearney is a philosopher but he’s also a magnificent writer. This one book taught me more about the importance of story than any other. Telling stories is as basic to human beings as eating. More so, in fact, for while food makes us live, stories are what make our lives worth living. This sets stories at the heart of human existence – not optional, but essential. Aristotle says in “Poetics” that storytelling is what gives us a shareable world. The key word there is “shareable”. It’s through the use of story that we communicate our subjective experience and its through the sharing of subjective experience that we connect, and identify with others. Without this transition from nature to narrative, from time suffered to time enacted and enunciated, it is debatable whether a merely biological life could ever be considered a truly human one. Beautifully expressed. Sets narrative at the heart of what it means to be human and stands it against those who would take a materialistic view of life which they claim can be reduced to data sets and DNA. Every life is in search of a narrative. We all seek, willy-nilly, to introduce some kind of concord into the everyday discord. This is one of my favourite lines in the whole book. This is exactly the power of story – it enables us to “get a handle on” life, to bring some kind of order out of chaos. What does Richard Kearney mean by story then? Well, I’ll finish this post with two more quotes from his book which make it very clear and very simple. When someone asks you who you are, you tell your story. That is, you recount your present condition in the light of past memories and future anticipations. This shows that story collapses time, bringing the past and the future into the present. Story telling requires memory, imagination and expression. a teller, a tale, something told about, and a recipient of the tale. Nice and simple, but what profundity lies in there. For every story, there is a unique human being doing the telling, there is the story itself and its subject matter, and, very importantly there’s the recipient – the listener or the reader. Story is, as Aristotle said, a way of creating a shareable world. That’s the greatest potential of blogs, I reckon. By sharing our stories we create a shared world. Yes, sure, stories can divide as well as connect, but without stories, there is no potential for connection, no potential for compassion and no potential for the creation of a meaning-full, and better world.